Strayed lays her heart bare in the book and on the screen. She unabashedly lays out a gruesome recounting of heartbreak, loss and bad decisions. She is beyond candid concerning her lack of experience as well as her moral failures. At no point does she claim expertise…in anything. In fact, she paints a picture of herself that is far from attractive. It is, at times, difficult to watch. I imagine it was even more difficult to endure. When confronted with this kind of raw confessional, our response is judgement? Really? Did we all come forth from the womb with an ultra-light pack, a 10 lb baseweight, practicing LNT ethics and obeying the levitical law to a point? Let he who is without sin cast the first stone…or boot. It’s not a documentary on how to backpack…or live, for that matter. It’s a story. It’s her story. Another criticism or complaint goes something like this, “Oh great, now everyone and their brother are going to hit the Pacific Crest Trail to try and ‘find themselves.” And that’s bad? My own story is not that different. Dana, Josiah and I followed Jesus right out of the doors of the institutional church and into the woods. The wilderness became for us a sanctuary and a place of healing. The trail community welcomed us with open arms and have become like family. Yes, I discovered myself on the trail. I discovered life and passion and saw a longing awakened that transformed my life. I know countless nemophilists who would echo that sentiment. Why disparage others from searching for the same? A related concern is that the hordes of newbies will cause irreparable damage to the trails. Granted, more traffic is going to bring about wear and tear. That’s unavoidable. Why not use this as a teaching opportunity? Great organizations such as The Pacific Coast Trail Association and the Appalachian Trail Conservancy have. They’ve seized upon this opportunity to raise awareness, teach trail etiquette and draw attention to causes that desperately need it. In addition, think for a moment about how you felt about caring for the wilderness before you discovered backpacking…and after. Conservation wasn’t even on my radar before I found my place in the woods. Now? Don’t get me started! At this moment in US history the protection of our wild places is on precarious ground. I just recently signed a petition to try and prevent the logging of a great national treasure, Pisgah National Forest…just a couple of hours from our home. What if these hordes of new hikers were to become passionate about caring for wilderness? Imagine the potential! I enjoyed the book. I enjoyed the film. I enjoyed it even more when I watched it with my wife. Dana lost her dad just a few months ago. I knew the early scenes would be difficult for her to get through. They were. I’ll admit, I strained to see her expression during those scenes and others. You know what I saw? Solidarity. She saw something of her own struggle in Cheryl’s tribulations. She resonated with the heartbreak. She identified with the call of the mountains and their promise of beauty and healing. She remembered what it was like when we were first starting out and had no clue what we were doing. She laughed sardonically with self deprecation at Cheryl’s bad luck, frustration and angst. When the boot flew off the mountain, I swear I saw Dana do a fist-pump. She rejoiced with Chery’s triumphs and gloried in the vistas attained. If for no reasons but these, I loved the film. C.S. Lewis said,”Friendship is born at that moment when one man says to another: “What! You too? I thought that no one but myself . . .” ” I’ve no doubt that were Dana and Cheryl to meet they’d be fast friends. Great story, great acting, great film making, struggle, heartache and redemption. Beautiful scenery, to boot. If you want to see a “How-To” on backpacking there are some good videos out there that’ll fit your need. 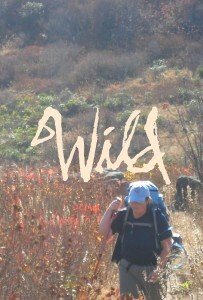 If you want to laugh, be moved and inspired see Wild. You’ll be glad you did. It’s not a documentary on how to backpack…or live, for that matter. It’s a story. It’s her story. And it’s a good one.